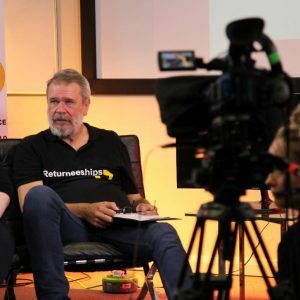 Keith was a learner on our Sunderland Returneeship course in 2018; he stepped forward to present the live show and conduct interviews on days 1 and 2. Below is what he had to say about the course. Keith had worked in construction for 40 years when he was struck down with rheumatism, resulting in him no longer being able to meet the physical demands of the job, which in turn led to unemployment. Although he had only been out of work for four months, after always being in employment and with no clear path ahead, Keith’s confidence was knocked. He was at Sunderland job centre when it was suggested that he might like to try the Returneeship and Keith thought he would try anything that would help him back into work. While Keith is generally confident meeting new people after his time working with different people on building sites, he still felt a little nervous starting the course as it was something new. He says that he was instantly put at ease as he was welcomed warmly by the Release Potential staff who then created a positive, can-do atmosphere. Keith had felt confident in the construction industry in his previous role but he found himself trying things that he had never experienced before. A natural extravert, Keith volunteered himself to interview people from the local community and before he knew it he was also presenting a magazine show. Although it was out of his comfort zone, he discovered he could adapt to a new situation. One of the aspects he had missed from working was the camaraderie with his colleagues and the Returneeship provided this as Keith said that after the first day everyone had bonded. This continued to deepen over the classroom phase and meant that it was a very supportive environment. As well as the qualifications, Keith felt that he learned a lot about himself through helping and encouraging other members of the group. After the work placement, he had a telephone call out of the blue from one of his former colleagues. They wanted someone for a contract to teach new recruits how to mix concrete for the Crossrail project in London and they wondered whether Keith was interested. It was a different role to his previous experience as it would be teaching rather than physically undertaking the work. Keith realised from the Returneeship course that he was able to adapt and he had developed skills where he could present information effectively and support others, so he happily accepted the contract.